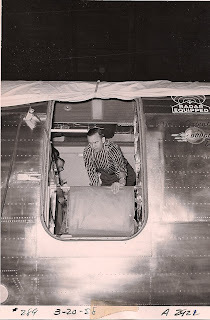 Lady Skywriter: Aircraft Evacuation Slide-1950s Style . 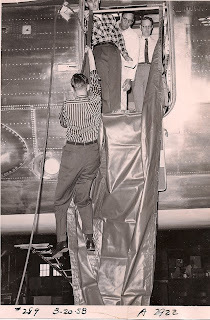 . . Lady Skywriter: Aircraft Evacuation Slide-1950s Style . . . 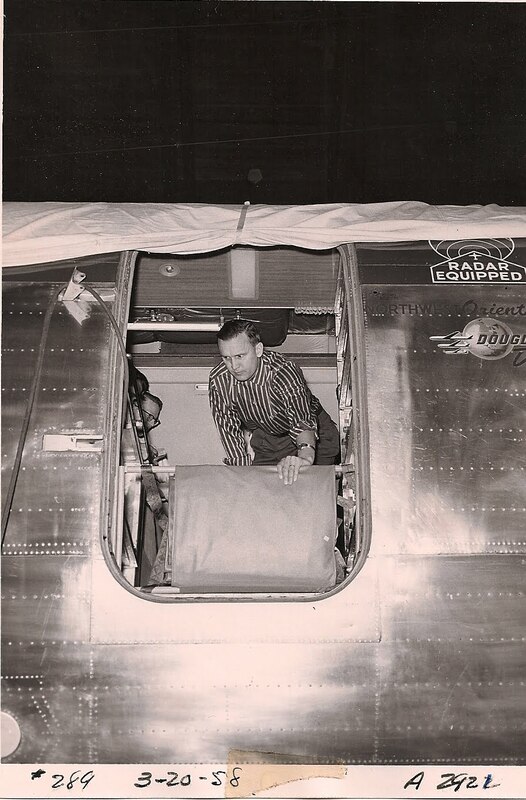 This photograph, dated March 20, 1958, shows Cliff Northfield demonstrating how to use a manually operated aircraft evacuation slide. I remember attending a training session for this slide. It was stored near the main cabin door, I don't remember exactly where. We were instructed to attach it to the open door and kick it out so it would fall to the ground. Here's Cliff again, letting himself down one side of the slide, arm over arm. The sides were attached to a bar that was fastened midway across the door. The idea was two strong males (volunteer passengers?) would be selected to clamber down as Cliff is, and once at the bottom they would hold the slide taut and at a slight angle, allowing passengers to slide down to safety after they removed shoes and any other sharp objects. It is a wonder more people weren't injured from the evacuation slide experience - both employees and passengers! Thank goodness I was never in a situation where the slide needed to be used. Anybody out there ever have to use one in real time?